How does vacuum excavation work? 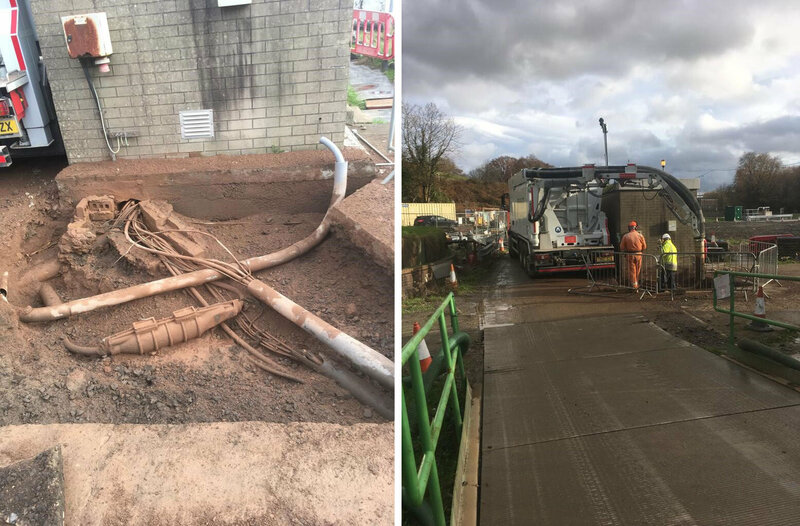 Vacuum Excavation was the best choice for work on this water treatment plant where a job was completed for a well-known Civil Engineering company who were looking for a safe and efficient way to excavate around buried cables. The area was congested with High-Voltage cables along with fragile data cables, making traditional excavation methods too high-risk. Employing the use of a Vacuum Excavator offered the best solution for this job because it allowed the work to be completed safely, quickly and cost-effectively. Excavation work in High-risk areas such as those congested with High Voltage cables often requires the use of a Vacuum Excavator because it carries a much lower risk of personal injury from cable strikes due to its precision based remote control power arm. In much the same way, the risk of damage to fragile cables, such as data cables, is greatly reduced because the suction arm is able to lightly and expertly lift the ground from around the buried services with very little force. This means it carries a much lower risk of service strikes. Along with its numerous safety benefits, Vacuum Excavation also offers a faster, more cost effective solution. A standard Vac Ex can remove 2m3 of spoil per hour while the inbuilt skip can hold up to 10m3 before needing to be emptied. This means that one vac ex can get the job done in a fraction of the time it would take a team of men or a digger, making a significant saving on man hours. We’re the leaders in Vacuum Excavation. With the largest hire fleet in the UK (and Europe), we provide national availability of safe excavation to support your construction and civil engineering projects. With new excavators added to our fleet throughout the year, you'll get around the clock hire, whenever you need us.